Home / Liquid cultures / Liquid culture vial – 100mL vial with nutrient solution. Sterile liquid culture vial 100mL – injection vial containing nutrient solution. 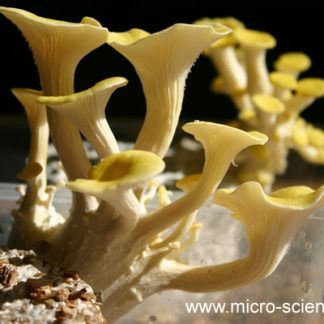 Useful for rapid expansion of fungal cultures or spores (ideal for oyster mushrooms). If you are starting a culture from spores, then simply remove centre from lid, swab and inject vial with a small amount of suspension (2-10mL). Within one or two weeks you will have 100mL of rapidly growing culture for further use. This is enough to inoculate up to 10 – 20 MycoFarms (unused culture can also be stored in the vial or syringes for some time in the fridge). Stored cultures can be used to inoculate another liquid vial in future avoiding the need to buy fresh oyster cultures or spores (ever again?). Agitate well to break up mycelium before withdrawing. Includes a groundbreaking device for the pressure-equalised withdrawing sterile mycelium cultures, sterile swabs and syringe for withdrawing mycelium. We can provide 10 x 10 mL or 2 x 50mL syringes for the same cost – please choose below.